Sarge opens the show by discussing the recent announcement by Alex Trebek that he has been diagnosed with Stage 4 Pancreatic Cancer. 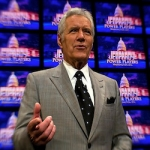 He intends to keep working and filming episodes of Jeopardy and says he’s going to fight and win the battle. Sarge goes on to discuss the issue of cancer in general and natural things that can be done to prevent or reverse cancer. He answers a question from a caller regarding Oreo Cookies and microwave popcorn being the two most dangerous snack foods according to Dr. Wallach. He also looks at an article that speaks to law makers beginning to use liberal doctors to promote gun control from the standpoint of guns being a national health crisis which is TOTAL BS! If the AMA was truly concerned about saving lives they’d issue a recommendation that all non-trauma center M.D.s should seek other forms of employment! Doctors kill far more people every year than people misusing guns! We’re talking about Strokes today on YDIYH!